Summary: The Barrier Island Center Education and Outreach Program will expand the diversity and quality of programming and materials available at the BIC. 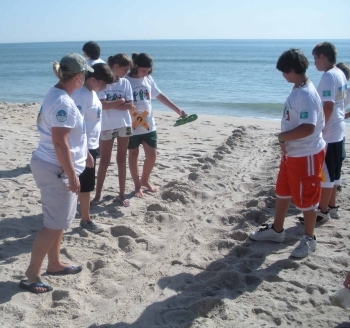 The goal will be to educate diverse stakeholders within the community about the ecology of sea turtles and the barrier island, and to develop a sense of stewardship for the Refuge and associated resources. The program will include the launching of an educational summer camp for regional school kids. The project also will establish an innovative multi-media public outreach program to be presented throughout Brevard and Indian River County schools. These expanded educational capabilities, along with improvements to existing printed educational resources, will help foster the kind of community support needed in order to properly manage and protect this important sea turtle nesting and developmental habitat.